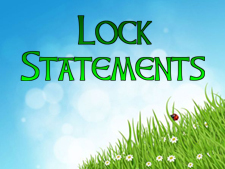 What is the benefit of using lock statement in C#? The lock statement handles lock segment as a critical section and locks the object during the execution of the program from other thread. Once the execution is completed it releases the lock and frees objects. // creating lock segment. all the resources that is used in lock segment, can't be used by another thread until it releases. In this chapter, you learned what Lock statement is in C# and how to use it in C# programming. In next chapter you will learn about Using Statement in C#.